Quinn, D. Michael. 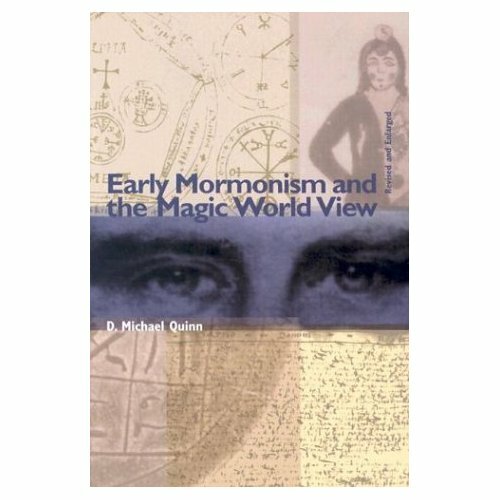 Early Mormonism and the Magic World View (revised and enlarged). 1998. Signature Books. Anyone who studies the foundational stories of Mormonism (even casually) is likely to encounter information about Joseph Smith and his involvement with the occult and his belief in (and participation in) magic rituals. Quinn solidly establishes that the entire Smith family and many of the early members of the LDS church held strong beliefs in occult practices, including treasure seeking, seer stones, divining rods, astrology, magical parchments, talismans, and other aspects of folk magic. Quinn paints a complex picture of how involvement in folk magic influenced Joseph’s view of the world, and how these practices influenced the development of the early church. Quinn argues that Joseph Smith and his family didn’t consider their involvement with folk magic to be at odds with their belief in Christianity. Rather, searching for buried treasure and using seer stones was a critical part of how they practiced their Christian faith. I feel like this book has provided me with some much-needed context surrounding the foundational stories of Mormonism. The traditional accounts of Joseph Smith’s first vision, his thrice-repeated visitation from Moroni, his 5-year quest to obtain the gold plates buried in the earth, and his use of seer-stones to produce the Book of Mormon all make a lot more sense after reading this book. Quinn establish the significance of each of these events to persons with a magic world view. If you’ve ever been curious about the rumors about Smith’s belief in magic usually repeated by critics of Smith and the LDS church, then this book is the definitive source for setting the record straight. Don’t be turned off by the near encyclopedic size of this book (650 pages???? wha…???). Half of it is reference citations that will be of no interest to you. The book is also written in a way that makes it easy to skip a page here and there when Quinn starts to get bogged down with details that only serious historians will care about. Overall, it’s a much quicker and easier read than I was anticipating and much more accessible to armchair historians than I was expecting. Hamilton, Tim. 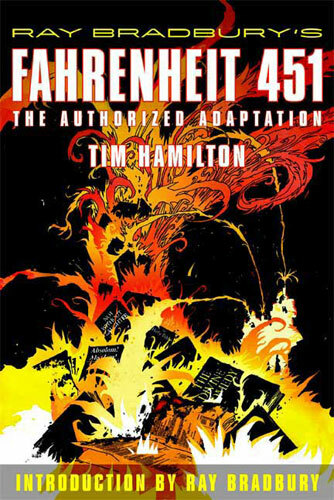 Ray Bradbury’s Fahrenheit 451: The Authorized Adaptation. 2009. Hill & Wang. New York. I picked up this graphic novel in Vienna to keep me occupied on the plane ride home. I really enjoyed reading it. I don’t think I read enough graphic novels. In the novel, Guy Montag is a “fireman” in a future year, where “firemen” go around burning books. Book have been made illegal in this future world. However, the novel is quick to point out that this isn’t a top-down government conspiracy to keep people in the dark. Books are illegal because the people demanded that they become illegal. In this future world, books began to take a back seat to other forms of media as attention spans shortened. Television became more popular, stories became shortened and condensed, and the people could no longer stomach full-length novels. In this futuristic society, comic books are the only books allowed because they are sufficiently dumbed down and provide plenty of pretty pictures for the now-weakened minds to digest. The irony of reading this book in comic book format is absolutely hilarious. 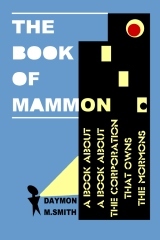 The Book of Mammon: A Book About A Book About The Corporation that Owns the Mormons. Daymon M. Smith. 2010. The book is an exposé of sorts, meaning, Smith’s primary objective is to share what he feels are abuses of power or mismanagement within the Church, or that the Church has simply lost it’s way. Unfortunately, in an annoyingly coy way, Smith tells the story through a veil of fiction just thick enough to destroy any credibility the book would otherwise have had. For example, in the Foreward, Smith includes a letter written by himself (dated year 2011), in which he describes that the book you are about to read was not written by himself about his own church employment, but by a fictional character named Daemon (not Daymon) who worked at the COB. The entire book is filled with references to supposedly fictional characters whom we are supposed to understand (with a wink and an elbow jab) are actually real persons and General Authorities of the Church. Unfortunately, the veil was just thick enough (or I’m just dull enough) that at the end of the book, I’m really not sure what I’m supposed to understand was true and what was false. The Church, he asserts, is trying to do just that – trying to serve both masters. Trying to be the Kingdom of God while also embracing corporate practices not dissimilar from any major multi-national corporation. Using examples from his employment at the COB, he shares many stories about how the Church operates. He tells stories about smuggling garments into 3rd world countries, scandals in the Japanese translation office, and General Authorities encouraging members to buy new scriptures because the Church printing department has too much inventory and Deseret Book needs to increase sales. He also asks questions about the types of cars given to General Authorities and Missionaries, subsidized lunches in the COB lunchroom, and the wholly corporate process that goes into producing church publications and materials. According to Smith, there is very little that distinguishes how the Church operates from how any other for-profit corporation operates. The only real difference between the Church and any other corporation, is that the Church isn’t nearly as efficient, since the Church isn’t financially accountable to its members (investors) the same way a corporation is accountable to its investors. Ultimately, each reader will have to draw their own conclusions from the stories Smith tells. Mostly, I’m frustrated that he didn’t just write a straight-forward book about his experiences. He has some great material, but hiding it behind a veil of fiction (which I suppose he did for legal purposes…) just left me confused. 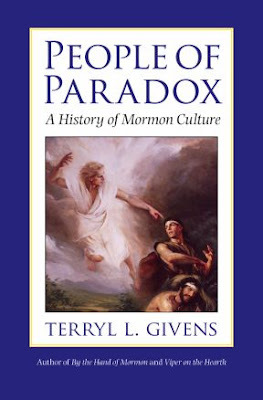 Givens, Terryl L. People of Paradox: A History of Mormon Culture. Oxford University Press. 2007. Confession: I didn’t read the whole book. I tried, but it was a hard read. I think this book was a few reading levels above me, so I struggled to follow it. Givens used a lot of words I didn’t really know, and his sentence structure is complex. I think this book was too smart for me. So I struggled with it. Givens proposes four paradoxes within LDS culture & theology within Part I of the book, which I won’t try to summarize here. I found this part of the book very thought provoking, but also hard to follow. In Parts II and III, Givens traces the history of Mormon culture in terms of dance, poetry, architecture, literature, theater, and other arts. I never really understood how Parts II and III related to Part I. Perhaps the best chapter in the book is called Fomenting the Pot, where Givens traces the history of intellectual freedom within the church. He discusses how many church leaders have allowed intellectuals within the church much freedom in publishing criticism about the church, while others haven’t tolerated any criticism from church members. It’s pretty obvious the previous owner of my copy of the book also liked this chapter. It was full of notes & stuff and the rest of the book wasn’t. Anyway, I’m gonna stop writing because I only read half the book and skimmed the other half, so I’ve really got no biz writing a book review. Baker, Elna. The New York Regional Mormon Singles Halloween Dance. Penguin Books. 2009. Elna Baker has collected many of her popular stories that she’s been performing all over New York and presents them together as a single, cohesive memoir about being a Mormon in New York City. I’d seen some youtube videos of the author performing some of her stand-up comedy and had really enjoyed it – and the printed version didn’t disappoint. The book is a very quick & easy read – I read the entire book in less than a week, which really says a lot about how much I enjoyed reading it. Baker is a talented storyteller, and the honesty of her memoirs is endearing. On the surface, Baker tells stories about dating, and her quest to find a boyfriend, but the book is ultimately about her relationship with God. It’s about how her Mormon faith has shaped her decisions, and how her decisions have subsequently shaped her faith. She describes how her faith evolves over time, and how she even loses faith altogether. Ultimately she finds her faith again, but it’s a much different type of faith than she once had. I could never have done this without your faith, support, and constant encouragement. Thank you for teaching me to believe in myself, in God, and in my dreams. This book… aside from the nine F-words, thirteen Sh-words, for A-holes, page 257, and the entire Warren Beatty chapter… is dedicated to you. If that doesn’t tell you that this is no ordinary LDS memoir, I don’t know what will. Baker does her best to present a narrative that is accessible to non-LDS readers. I think she’s mostly successful, although I expect non-LDS readers will not be able to fully appreciate exactly how and why her faith plays such an important role throughout the book. Also, I like it anytime a Mormon is successful – especially non conventional Mormons. I don’t know why, I just do. So buy the book. Imboden, Thatcher. Phillips, Cedar Imboden. Images of America: Uptown Minneapolis. Arcadia Publishing. 2004. This book is part of the Arcadia Publishing Images of America series. It’s a quick read – it’s essentially all photos with captions. I really enjoyed reading about the evolution of Uptown. Anyone who regularly visits uptown will find the history of the Hennepin-Lake business district interesting. The book uses historical images arranged in roughly chronological order to trace the development and redevelopment of the area. It tells about the ill-fated West High School, the several bath houses that used to be along Lake Calhoun, the nearly forgotten ice harvesting and horse stabling businesses in the area, and the other local businesses that have existed in the area throughout the years. While I learned a lot from the book, at times it seemed a little light on details. Also, for such a short book, quite a few of the photos felt like fill material. Still, it’s a quick & enjoyable way to learn more about the history of Uptown. 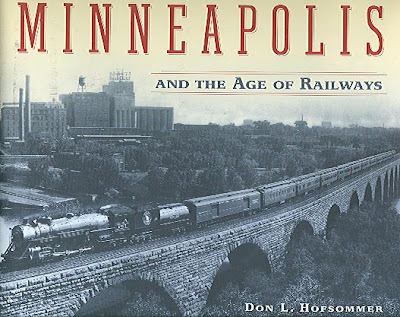 Hofsommer, Don L. Minneapolis and the Age of Railways. University of Minnesota Press. 2005. In this book, Hofsommer gives a very detailed look at the history of the railroad industry in Minneapolis. He describes the major players in the development of the Minneapolis rail network and the different rail companies that constructed and operated them. I’ll be honest, I didn’t actually read past the first two chapters. After that, I decided that the historic pictures were the most interesting part of this book for me, so I just flipped through and looked at the pictures and read the captions. And to be sure, the pictures are GREAT. Bushman, Richard Lyman. 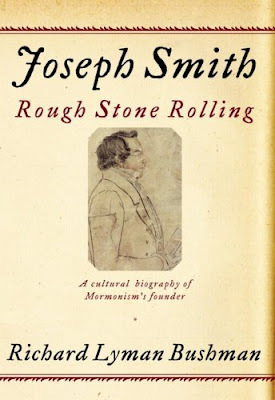 Joseph Smith: Rough Stone Rolling. Vintage Books. 2007. This book took me a long time to finish – nearly four months! At 784 pages, this is easily one of the largest books I’ve ever read. I won’t try to comment on the historical accuracy of the research, because I’m simply not qualified. I really enjoyed reading most of this biography. It assumes a faithful approach and always gives Joseph the benefit of the doubt. The authors faith is evident in the conclusions drawn from the historical facts. What is really remarkable about the book is how Bushman sets the stage for active Latter-day Saints to confront and understand difficult aspects of LDS history without coming to the conclusion that Joseph Smith was a liar or a fraud. Bushman does Mormonism a great service by portraying Joseph Smith as a man attempting to do the will of God, subject to his own humanistic limitations. Bushman presents Joseph to be more idealistic than ideal. While it is evident that Bushman would support Joseph as a prophet regardless of the historical record, he doesn’t shy away from discussing Joseph’s flaws & mistakes. The result is a very readable narrative that presents Joseph as a dynamic & charismatic leader, always intent on establishing Zion, never quite aware of his own limitations. Joseph is portrayed as a master religion builder & organizer, eager to establish rituals & ordinances, and always expanding the scope of Christianity. I would recommend this book for nearly anyone. The book assumes the reader has a basic understanding of general Mormon history (it continually uses phrases like “before the saints migrated to the west…,” seemingly unaware that novice readers might not know about the mass exodus westward. But it’s still certainly an entry-level book – a basic introduction to historical issues surrounding early Mormonism. It was a good follow-up to No Man Knows my History, the other biography of Joseph Smith I read several months ago. Flint, Anthony. This Land: The Battle over Sprawl and the Future of America. Baltimore: Johns Hopkins University Press. 2006. Flint provides a very accessible introduction to the issues of urban sprawl, smart growth, and New Urbanism. He talks about smart growth, what it is, why he thinks its important, and the significant barriers that stand in the way. Although his pro-smart-growth bias is always clear, he does a pretty good job explaining the challenges and arguments against smart growth in a fair manner. Ultimately, Flint contributes relatively few original ideas and his conclusions and his recommendations are weak. Still, it is presented in a highly readable and accessible format that make the book fun and easy to read. 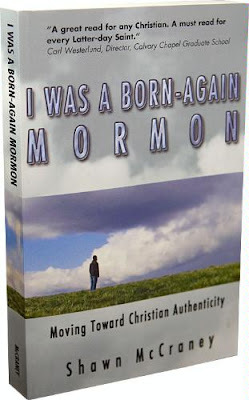 McCraney, Shawn A. I was a Born-Again Mormon: Moving Toward Christian Authenticity. 2nd Printing (Edition). Alathea Press. 2007. I enjoyed reading this book, despite several obvious deficiencies. At first glance, the book has several distracting elements: spelling errors, incorrectly used words, gramatical errors, constant idioms, and unrealistically simplified analogies. These shortcomings make the reader constantly aware that the book is amateur at best. Page margins are wonky, the chapters are unnumbered and grouped in “Sections,” there’s no table of contents or index, and I’m told that the first edition didn’t even have page numbers. In the book, the author describes his personal religious journey – he was an active member of the LDS church, serving in various capacities including serving a full-time mission, Seminary teacher, Bishop’s Counselor, and Young Men’s President. But his religious journey eventually led him to have a “born-again experience.” Although he considered himself a born-again christian, he continued to worship and serve in the LDS church for several years before requesting excommunication. The most interesting and valuable part of the book was his discussion of his experiences being a member of the LDS church while not believing many core LDS teachings. He gives well-reasoned, pragmatic advice for others in similar situations. The book’s most valuable contribution is his narrative describing his own personal thoughts, feelings, experiences, and anecdotes about his spiritual journey. In general, I found them thoughtful and faith-promoting. In some ways, the amateur deficiencies I described earlier may actually help the author make his point more powerfully because the reader knows the text has not been professionally edited or extensively revised. Instead, it contains raw text directly from the author to the reader – and since one of the author’s main theses is that all humans are inevitably flawed, it is fitting that the book itself contains obvious errors. Unfortunately, McCraney devotes a large portion of the book to discussing the history of the LDS church and LDS theology. Much better discussions of both of these topics can be found elsewhere, so I recommend readers skip these portions – especially readers with a basic understanding of LDS history and theology. It’s not necessarily that anything he says about them is incorrect – it’s just that other authors have done a much better job with these same topics. I decided to read this book after listening to audio-casts of the author’s weekly television program, Heart of the Matter. Although both the book and TV show share common themes, there are significant differences as well. On the TV program, McCraney is loud, brash, argumentative, and downright rude, but the book portrays a much softer, gentler side of the author. Much can be said about the book regarding the subtitle: Moving Toward Christian Authenticity. One of his basic theses is that the LDS Church can and should join mainstream Christianity by placing greater emphasis on the Grace of Christ. He even discusses how he believes the LDS church could join mainstream Christianity without losing some of the most unique LDS teachings.